Providing backing for the Android Strongbox Keymaster module, including Trusted User Presence and Protected Confirmation. Titan M has direct electrical connections to the Pixel’s side buttons, so a remote attacker can’t fake button presses. These features are available to third-party apps, such as FIDO U2F Authentication. Ensuring that even Google can’t unlock a phone or install firmware updates without the owner’s cooperation with Insider Attack Resistance. Including Titan M in Pixel 3 devices substantially reduces the attack surface. Because Titan M is a separate chip, the physical isolation mitigates against entire classes of hardware-level exploits such as Rowhammer, Spectre, and Meltdown. Titan M’s processor, caches, memory, and persistent storage are not shared with the rest of the phone’s system, so side channel attacks like these—which rely on subtle, unplanned interactions between internal circuits of a single component—are nearly impossible. 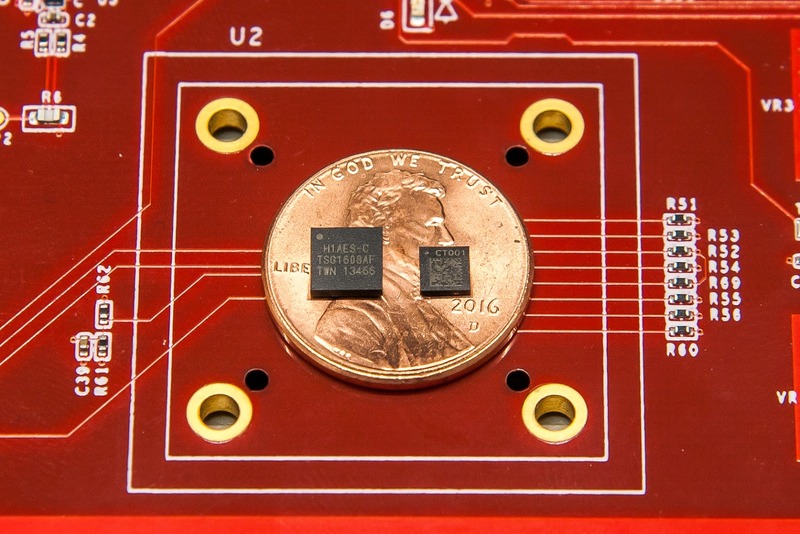 In addition to its physical isolation, the Titan M chip contains many defenses to protect against external attacks. 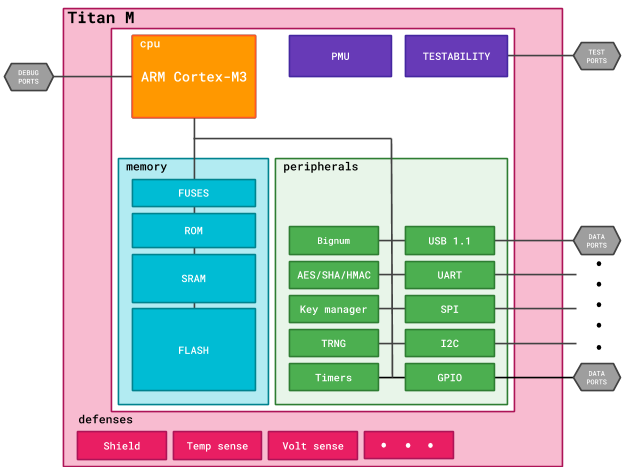 But Titan M is not just a hardened security microcontroller, but rather a full-lifecycle approach to security with Pixel devices in mind. Titan M’s security takes into consideration all the features visible to Android down to the lowest level physical and electrical circuit design and extends beyond each physical device to our supply chain and manufacturing processes. At the physical level, we incorporated essential features optimized for the mobile experience: low power usage, low-latency, hardware crypto acceleration, tamper detection, and secure, timely firmware updates. We improved and invested in the supply chain for Titan M by creating a custom provisioning process, which provides us with transparency and control starting from the earliest silicon stages. While implementing Titan M firmware, we had to take many system constraints into consideration. For example, packing as many security features into Titan M’s 64 Kbytes of RAM required all firmware to execute exclusively off the stack. And to reduce flash-wear, RAM contents can be preserved even during low-power mode when most hardware modules are turned off. Transparency around every step of the design process — from logic gates to boot code to the applications — gives us confidence in the defenses we’re providing for our users. We know what’s inside, how it got there, how it works, and who can make changes.